GÉANT and RedCLARA, the Latin American Research and Education Network, have entered into an Indefeasible Right of Use (IRU) contract with EllaLink, for spectrum on a direct submarine cable connecting Europe and Latin America. GÉANT is Europe’s leading collaboration on network and related infrastructure and services for the research and education community. The transatlantic capacity was procured on behalf of the Building the Europe Link with Latin America (BELLA) Consortium. Beneficiaries include the European and Latin American research and education communities for the next quarter of a century, in areas such as astronomy, particle physics, and earth observation. With funding from the European Union (EU) and the Latin American NREN community, the IRU represents a key financial element in the building of the EllaLink cable, which is expected to be operational in late 2020. GÉANT and RedCLARA were first interconnected in 2003 under the EU-funded ALICE project to support scientific and academic collaboration between the two continents. Since then connections speeds have grown by over 1,600% from 622 Mbps to the current 10 Gbps. However, there is no direct submarine cable capable of supporting research and education data needs between Europe and Latin America, limiting capacity and cost-effectiveness. EllaLink, a proposed submarine cable system promises to bring the most direct fiber connectivity between Brazil and Europe. EMACOM - Telecomunicações da Madeira - announced the signing of a contract to develop the system with direct links to the islands of Madeira. The expected ready-for-service is 2020. EllaLink will be a 3 fiber pair systems linking Southern Europe (Sines – Lisbon – Madrid) to LATAM (Fortaleza – Sao Paulo). Three intermediate branches are also being planned to land in Cabo Verde, the Canary Islands and Madeira. The main section of the cable traveling from Sines to Fortaleza is approximately 5900 km. 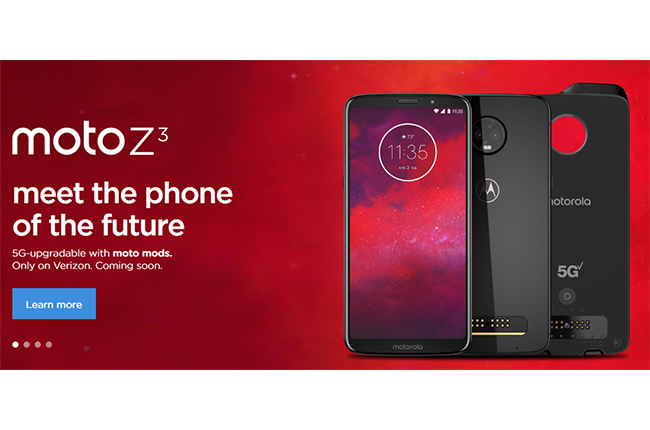 Verizon will begin selling Motorola's new moto z3 and 5G moto mod smartphones, which will be able to use Verizon's forthcoming 5G mobile service network when it launches in 2019. The moto z3 will connect to Verizon’s mobile 5G service over millimeter wave spectrum. 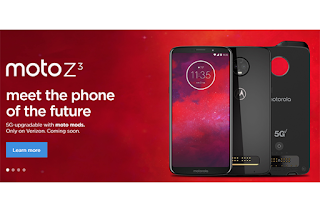 The moto z3 features all-day battery life, TurboPower charging, dual 12-MP, depth-sensing smart cameras that work with Google Lens and a nearly borderless 6” Super AMOLED display. The moto z3 will be available in the U.S. exclusively through Verizon starting on August 16 at $20 a month for 24 months on Verizon’s device payment plan ($480 retail; 0% APR). Verizon plans to launch 5G residential broadband service in four markets in the U.S. – including Houston, Los Angeles, Sacramento and one additional city, to be named – in the second half of 2018, followed by a mobile 5G solution in 2019. The FCC announced application and bidding procedures for the upcoming Spectrum Frontiers auctions of Upper Microwave Flexible Use Service licenses in the 28 GHz (27.5-28.35 GHz) and 24 GHz (24.25-24.45, 24.75-25.25 GHz) bands. The bidding for the 28 GHz UMFUS licenses (Auction 101) will commence on November 14, 2018, and the bidding for the 24 GHz licenses (Auction 102) will commence after the bidding concludes in Auction 101. Certain auction rules, such as the prohibition on certain communications, will apply across both auctions. "This is the latest in a long line of FCC efforts to make high-band spectrum available for flexible wireless use—efforts like the 2017 and 2018 Spectrum Frontiers Orders. And we’re not stopping with these two auctions. In the second half of 2019, we intend to hold an auction of three more millimeter-wave spectrum bands: 37 GHz, 39 GHz, and 47 GHz. Between that auction and the auctions for which we establish procedures today, we’ll push almost 5 gigahertz of spectrum into the commercial marketplace over the course of the next seventeen months. We’re also reforming our wireless infrastructure rules to ensure that the small-cell and fiber-based networks of the future can be built, for all the 5G spectrum in the world is pointless without 5G networks to make use of it. These are the kinds of aggressive actions we need to take to promote innovation, investment, and United States leadership in 5G." Cisco agreed to acquire Duo Security, a start-up based in Ann Arbor, Michigan, for $2.3 billion in cash and assumed equity awards. Duo was founded by Dug Song, Jon Oberheide. Duo has raised $119 million in venture capital. Investors in Duo included Benchmark, Index Ventures, Geodesic Capital, Meritech Capital Partners, Google Ventures, Redpoint, Lead Edge Capital, true ventures, and workday. Arista Networks reported revenue of $519.8 million for its second quarter of 2018, an increase of 10.0% compared to its first quarter of 2018, and an increase of 28.3% from the second quarter of 2017. GAAP gross margin was 64.2%. GAAP net income of $150.7 million, or $1.86 per diluted share, compared to GAAP net income of $102.7 million, or $1.30 per diluted share, in the second quarter of 2017. Non-GAAP net income of $155.7 million, or $1.93 per diluted share, compared to non-GAAP net income of $105.5 million, or $1.34 per diluted share, in the second quarter of 2017. 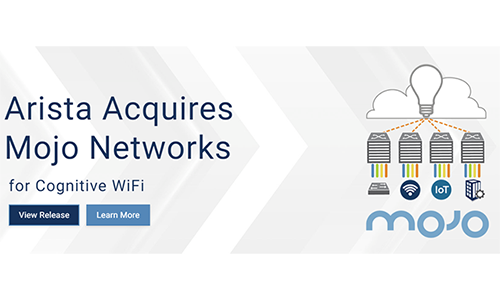 Arista agreed to acquire Mojo Networks for its Cognitive WiFi and cloud-managed wireless networking. “We are excited about Arista's first acquisition transaction and its significance to Arista's cognitive campus vision. We welcome the Mojo Networks employees to the Arista family,” stated Ms. Ullal. Financial terms were not disclosed. Mojo is based in Mountain View, California. The FCC adopted new rules aimed at promoting broadband and fiber backhaul buildouts by speeding the process and reducing the costs of attaching new network facilities to utility poles. The new “one-touch, make-ready” allows the party seeking to attach new equipment to a pole to prepare the pole quickly, rather than spreading the work across multiple parties. The FCC estimates that "one-touch, make-ready" could result in approximately 8.3 million incremental premises passed with fiber and about $12.6 billion in incremental fiber capital expenditures. The process will not apply to more complicated attachments, or above the “communications space” of a pole, where safety and reliability risks are greater, but the Order improves current processes for attachments in these spaces. Nutanix agreed to acquire Mainframe2 (Frame), which specializes in cloud-based Windows desktop and application delivery. Financial terms were not disclosed. Frame is a global, infrastructure-independent platform built to deliver Windows applications from the cloud. Frame supports multi-cloud delivery models, allowing IT teams to deliver virtual desktops from public clouds and their own enterprise datacenter – with common tooling and management constructs. The company is based in San Mateo, California. Frame is a global, infrastructure-independent platform built to deliver Windows applications from the cloud. "Companies desperately need a cloud-native desktop solution for their multi-cloud environments which combines the performance of on-prem offerings with the flexibility and cost optimization of the cloud. That’s why we built Frame,” said Nikola Bozinovic, Founder and CEO at Frame. “Nutanix shares our vision of simplifying critical IT functions so companies can save money, save time and still achieve exceptional performance no matter their underlying infrastructure, and we’re so proud to be joining the family." Responding to a recent Congressional directive, the FCC announced rules to reimburse certain Low Power TV (LPTV), TV translator, and FM stations for costs incurred as a result of the spectrum incentive auction. Full power, Class A, and MVPD already receive compensation for certain costs incurred by the incentive auction. The list of eligible entities is now being expanded.